Is a cruise for me? With so many tempting cruises on offer these days it’s a question, I think, many of us who might not have seen ourselves taking to life afloat are asking. It’s easy to see why when you flick through a cruise brochure or browsing the offers online: besides the popular cruising grounds like the Mediterranean – all that culture – and the Caribbean with its blue waters and white sand beaches, there are itineraries that take you north and south, east and west, from the spectacular scenery of the Norwegian fjords and the Antarctic, to Asia’s exotic and intriguing cities and the far flung islands of the South Pacific. And all this staying in comfort on ships whose facilities alone might entice you for a relaxing break. So do you book a cruise? As someone who tends to travel independently I wonder how I would find onboard life and how it would be visiting a place on a schedule for a shorter length of time than I’m used to – in some ways I think you might pack more in. Then too, there is the cost and time, ocean cruises are usually a minimum of 7 nights, around two week or longer trips are usual – you want to be sure it’s for you. 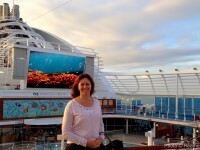 One answer is to try one of the taster cruises which some cruise lines offer, which is what Heather Cowper of heatheronhertravels.com is doing cruising aboard Princess Cruises’ ship Crown Princess on a 4 night mini cruise out of Southampton. 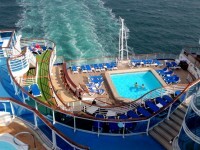 We will be posting her day by day diary in theonlinetraveljournal.com and putting her cruise on the map as she sails along. Do follow and find out whether cruising could be for you. 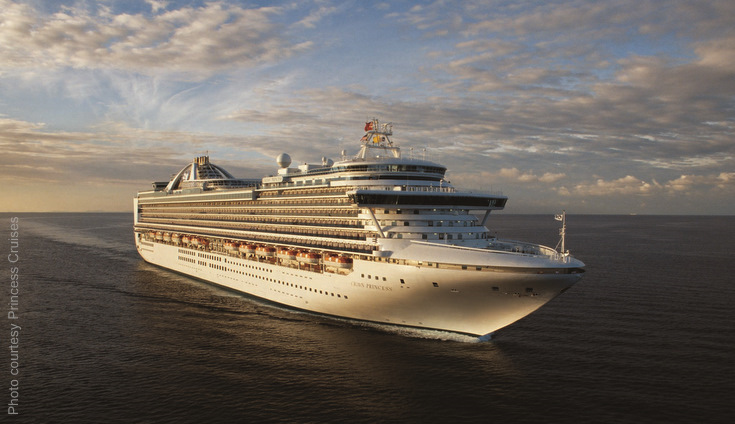 Follow Heather’s cruise on the map as she takes a taster cruise from Southampton aboard the Crown Princess to get a feel of cruising life. With photos and day by day diary. 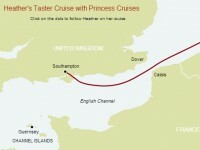 Day 4 of Heather’s Taster Cruise with Princess Cruises. Crown Princess is anchored off St Peter Port in the Channel Islands, time to take the tender ashore to explore Guernsey. Day 2 of Heather’s taster cruise and Crown Princess has docked in Rotterdam, the Netherland’s second city with a rich maritime heritage. Heather and her husband Guy spend the day exploring and are recommended a tasty seafood lunch. 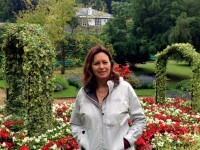 Day 1 of Heather Cowper’s taster cruise – Heather and husband Guy board the Crown Princess in Southampton and explore the ship.